Following Dora's triumphant return to Tompkins Square on Monday, I was apprehensive about how Christo and Nora would react to her sudden presence. As soon as Dora perched in a tree, Christo appeared and called to her. He seemed to recognize her right away, which made me happy. 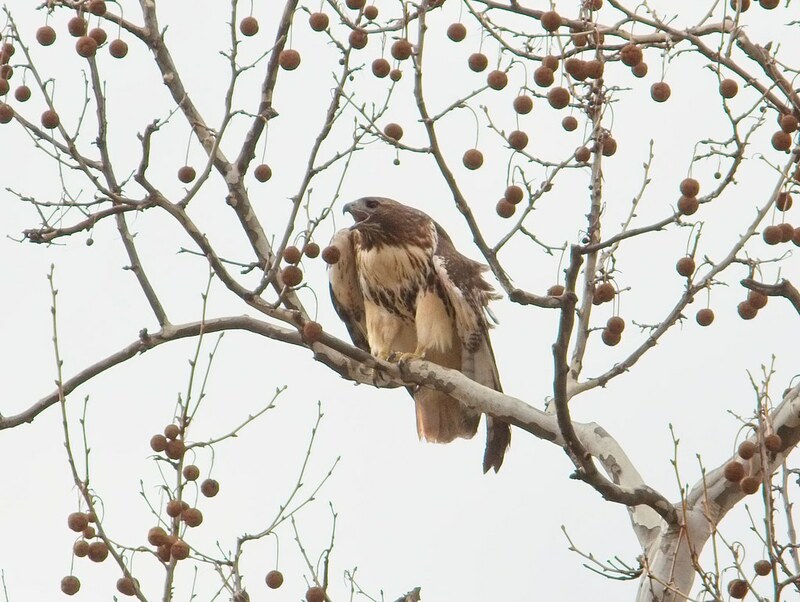 He flew off after about ten minutes and Dora spent the next hour or so resting and preening high in a tree. 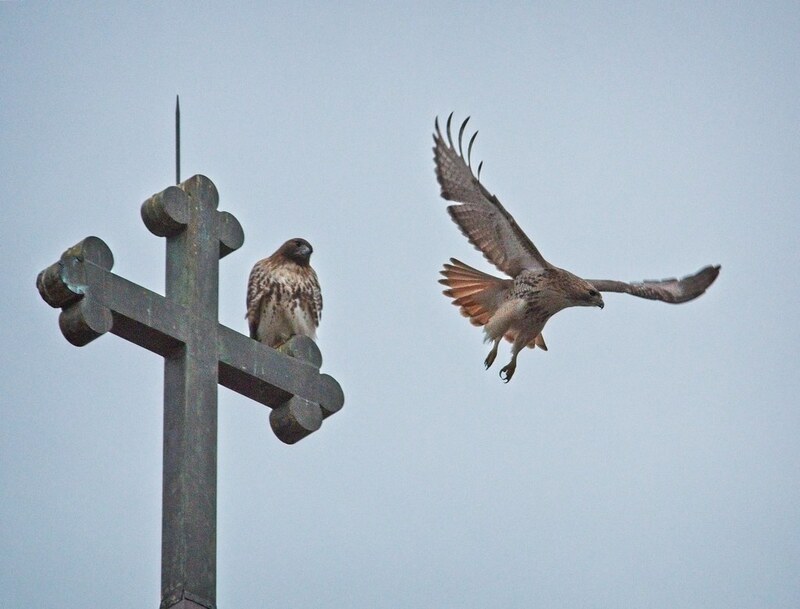 Then Nora appeared atop the Christodora (below, left). 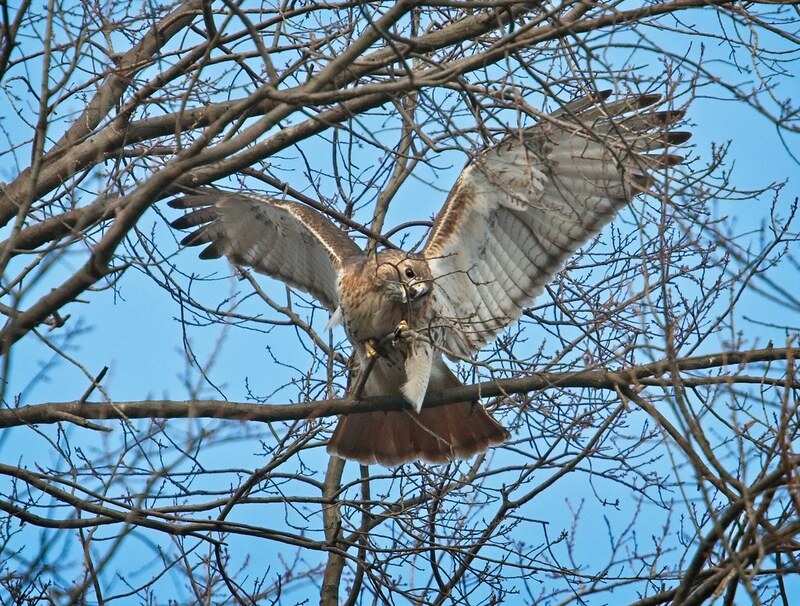 Nora perched there for a couple of minutes before taking off and circling above the tree where Dora sat. Then all hell broke loose. Dora flew out of the tree and went towards the center of the park. Nora quickly followed, as did Christo. 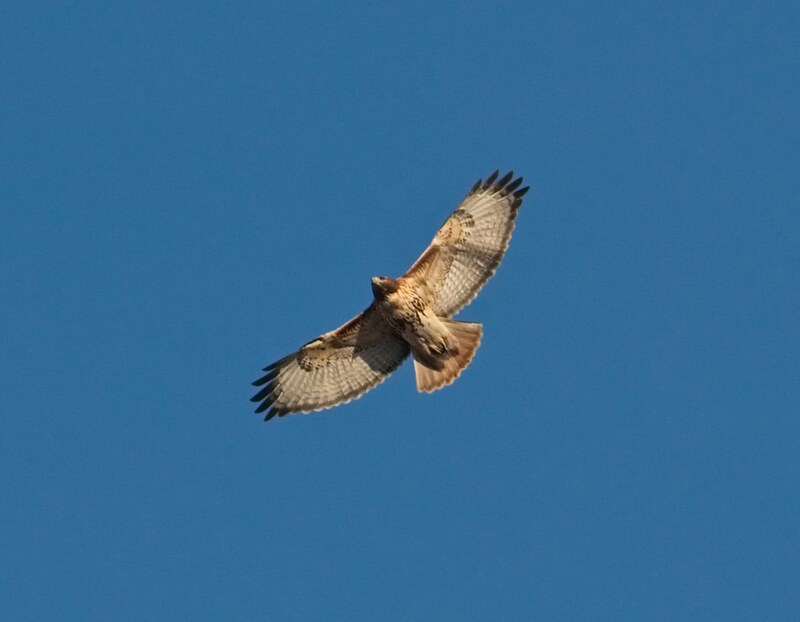 All three hawks flew around the park screaming, as did all the people who were running around trying to keep track of all of them! 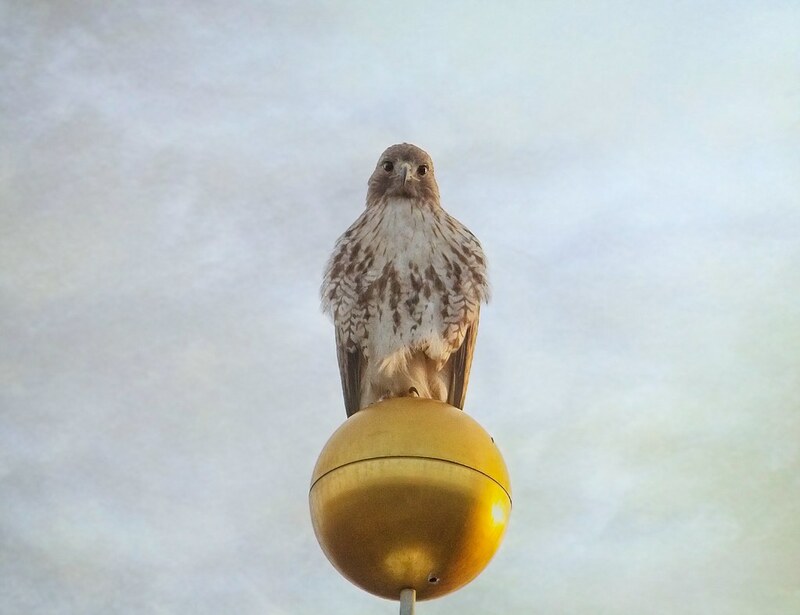 Dora briefly perched in the old 2017 nest near the Temperance Fountain. 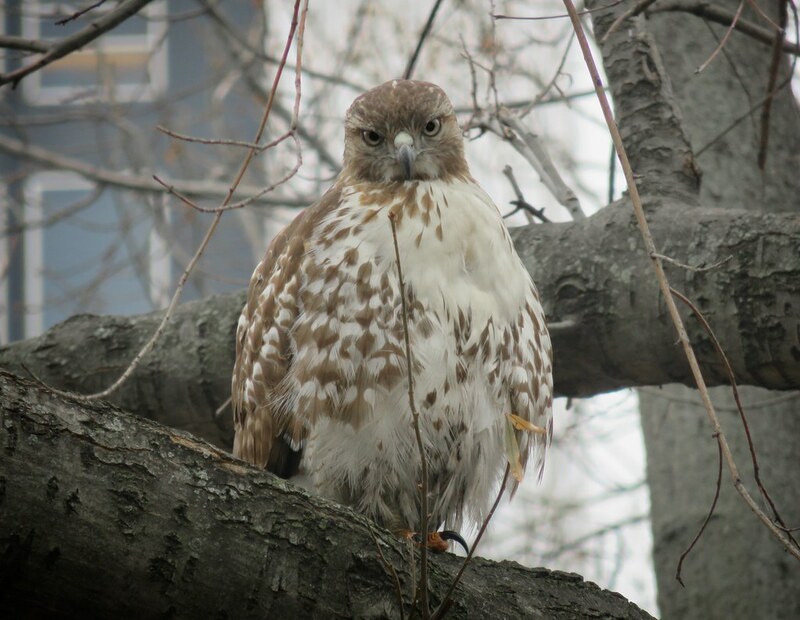 Then she moved to the tall sycamore tree on Avenue A and St Mark's Place and screamed. While she was there, Nora and Christo flew to the top of a building on 7th Street and Avenue A. All three of them were vocalizing and it was chaos for several minutes as I tried to follow all of them. I have to be honest and say I was disappointed that Christo stuck so close to Nora, but he probably chose to stay with her because she is his most recent mate and it made sense to him. Nora likely saw Dora as an intruder in her territory, so she naturally got upset. Christo and Nora left the park and Dora flew behind some buildings on Avenue A, so the park was suddenly hawkless. 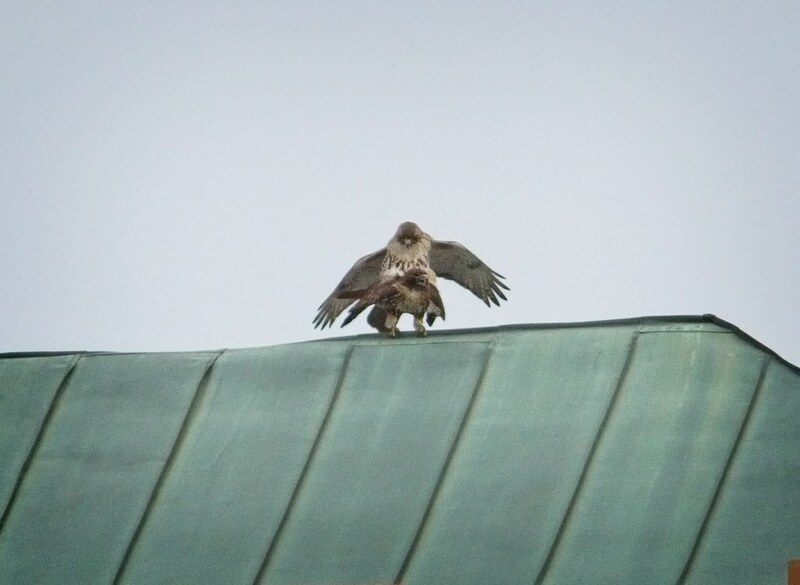 After a half hour or so, Christo and Nora reappeared atop the Christodora and began mating. 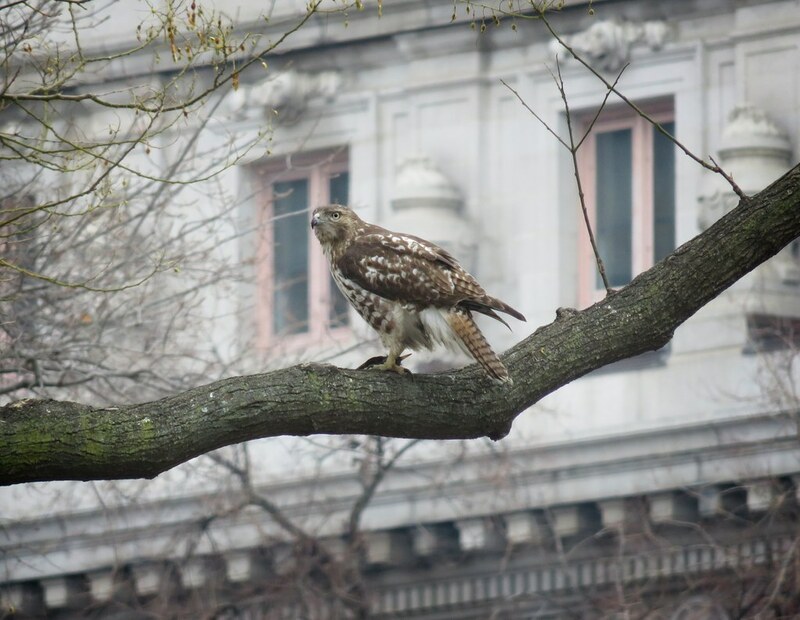 As I watched this from the park near the flag pole, Dora reappeared in a tree near the Temperance Fountain. My heart sank knowing she saw Christo taking up with another female. After that rude display, Christo and Nora left the area for the rest of the day. 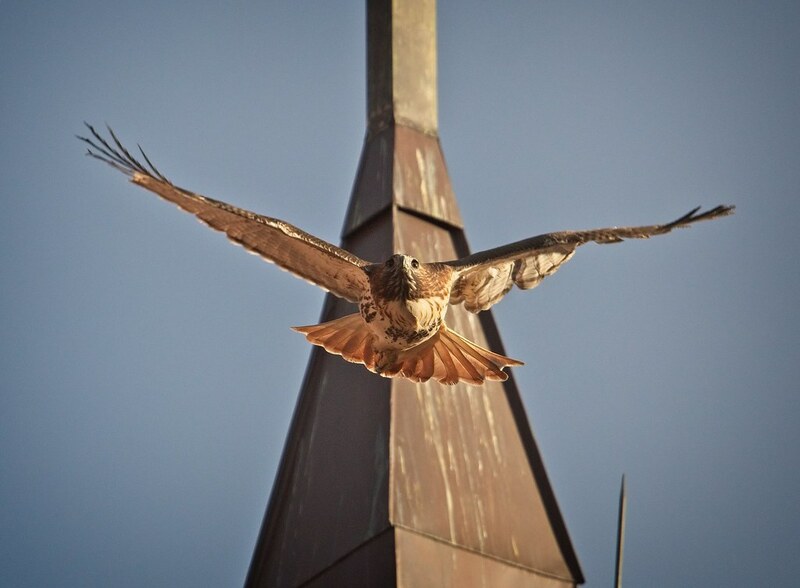 Dora, having the park to herself, visited some of her regular perches like St Brigid's church on Avenue B. 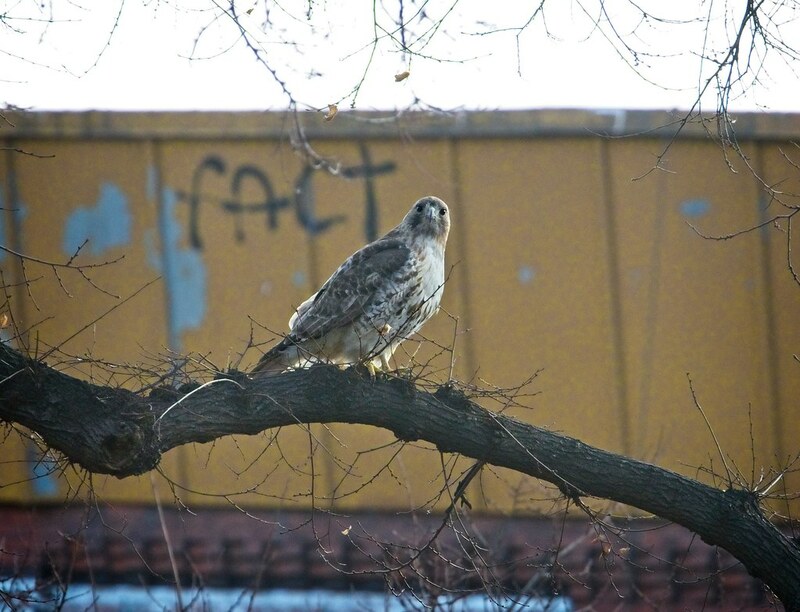 She spent the last hour or so of the day sitting in the ginkgo nest before going to roost on a fire escape on 7th Street. Christo reappeared on the cross of St Nicholas of Myra church on Avenue A and 10th Street after sunset, then went to roost in some trees on the north side of the park. 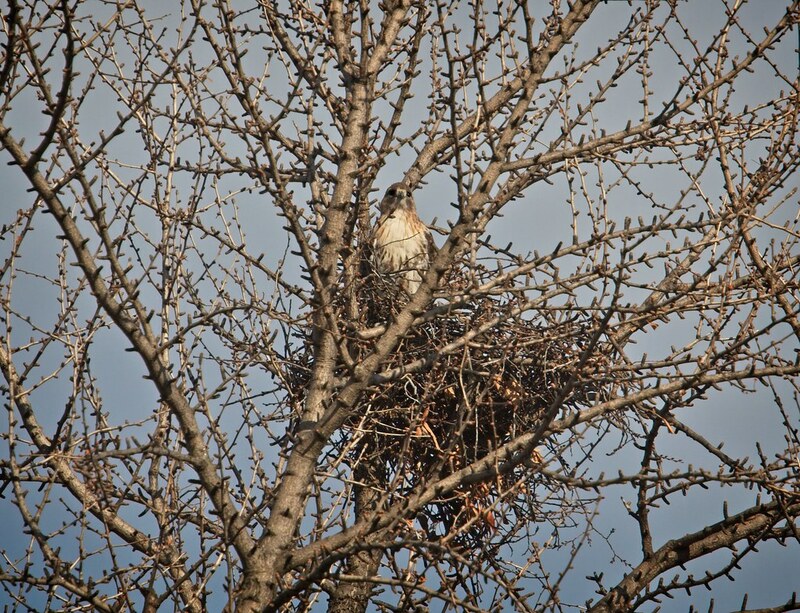 The following morning (Tuesday), fellow hawk-watchers reported that Christo and Dora spent at least an hour working together on the ginkgo nest. This was very good news as it means they're bonding again. Around mid-day, Dora flew south of the park and wasn't seen the rest of the day. 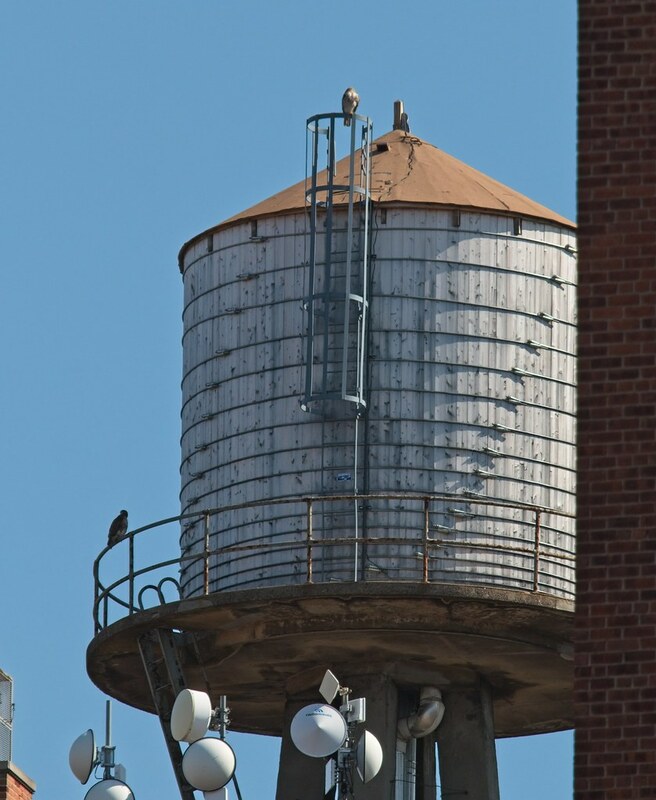 I was curious about where Nora might be, so I went searching and found her with Christo on a water tower at the Lillian Wald Houses on Avenue D. In the photo below, Christo is on top of the tower and Nora is on the railing lower down on the left. 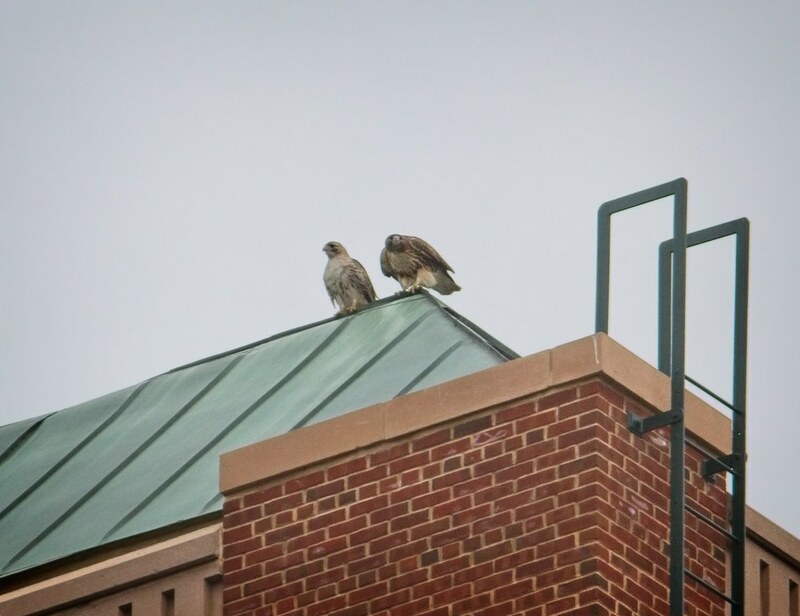 The pair flew off the tower and went north, so I followed them up Avenue D a couple of blocks where I found them mating on a rooftop at the Jacob Riis Houses. 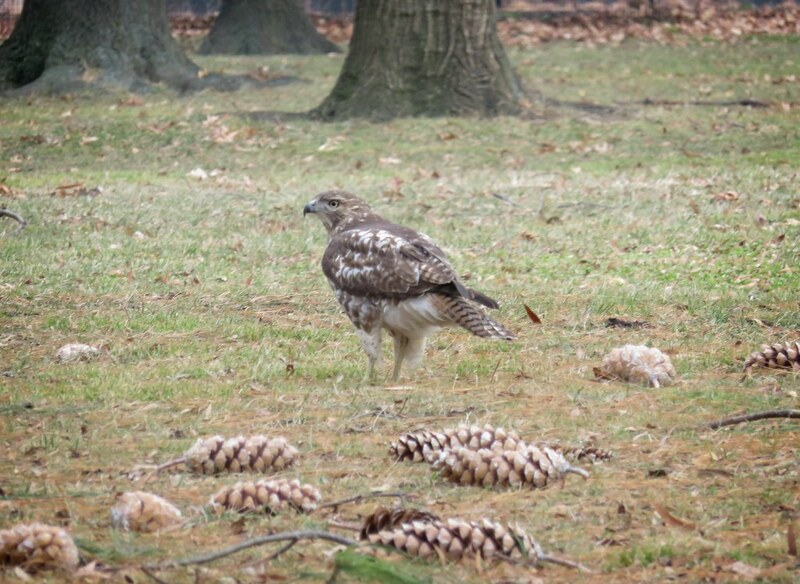 I returned to Tompkins where, in the absence of all the adult hawks, an immature red-tailed hawk was inexplicably hanging out in the middle of the park. More on that in the next post. 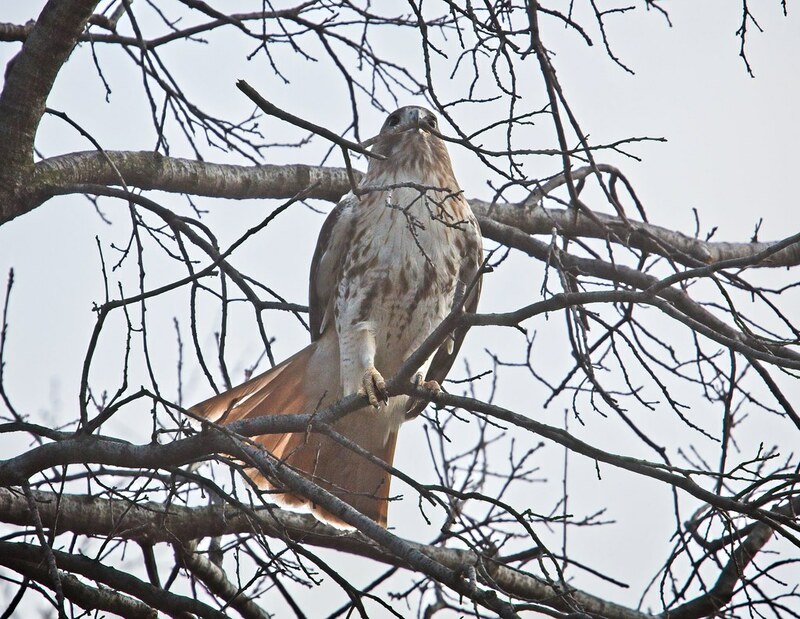 Tuesday's visit left me with more questions than answers, so I was happy to receive reports this morning (Wednesday) from dedicated early-rising hawk-watchers that Christo and Dora were again working on the nest in the ginkgo tree in Tompkins Square. I returned to the park this afternoon and was pleased to see Dora stay in view the entire time. When I left her tonight, she had gone to roost on a fire escape near St Brigid's church. 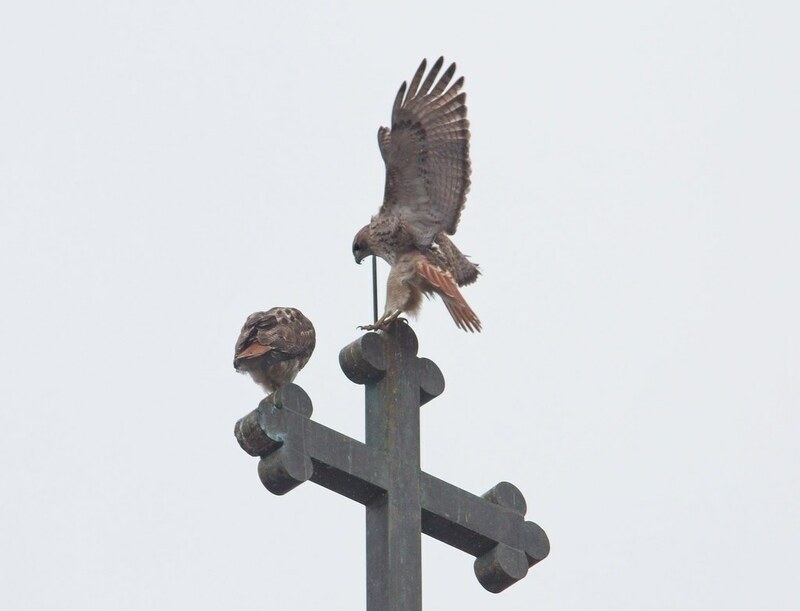 It's only the third day since Dora has returned, but it seems that Christo is looking after both female hawks. 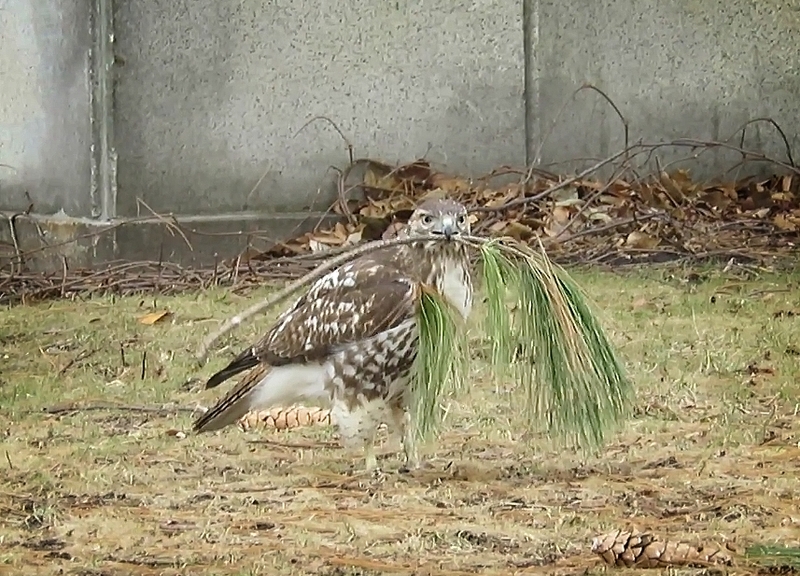 Dora is staying in and around the park while Nora prefers to stick to the tall buildings along Avenue D. I've seen Christo and Nora mating, but Christo and Dora are building the ginkgo nest together. I haven't seen him mate with Dora yet and I don't know yet if he has a nest with Nora. Christo seems willing and able to take on two families, but I have to wonder if Dora and Nora would tolerate that. The next few days should be interesting. 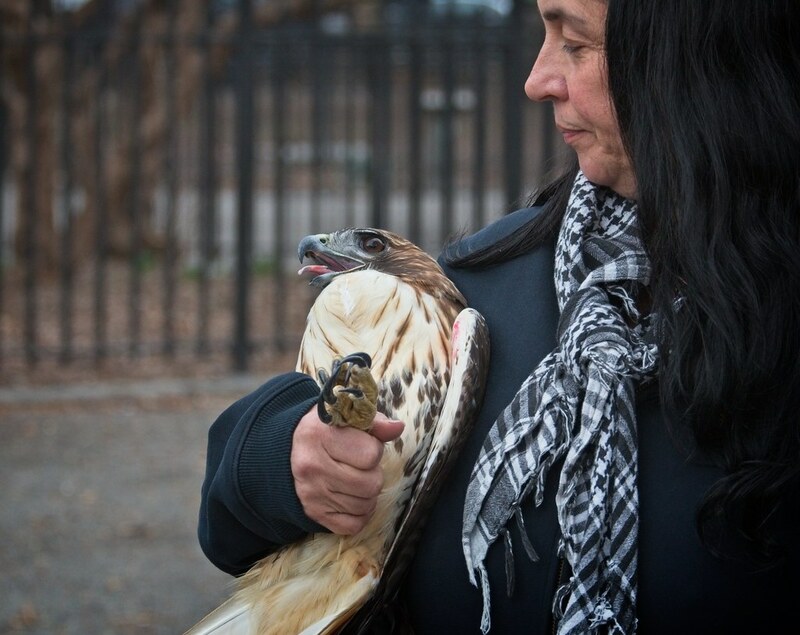 Today was a big day in Tompkins Square as Dora returned from rehab after suffering a wing injury in late November. 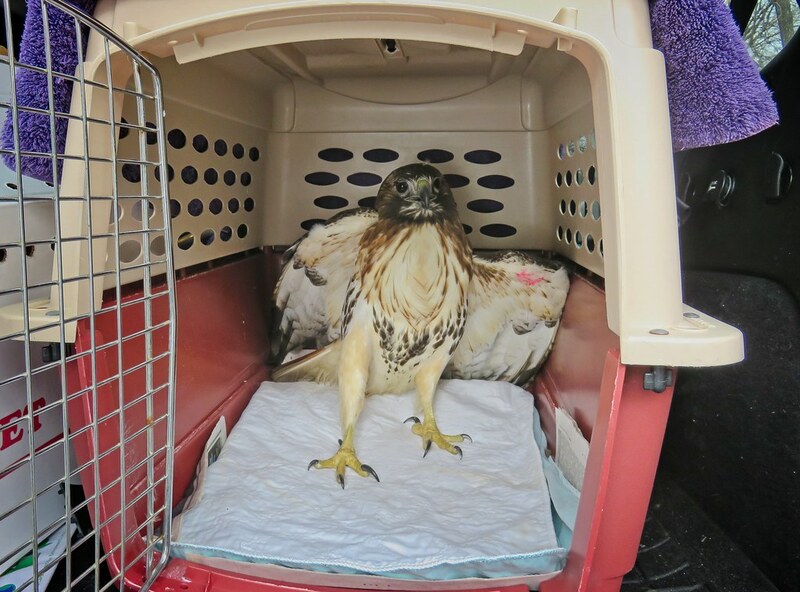 She's been in the care of Wildlife in Need of Rescue and Rehabilitation (WINORR), where she was able to heal and regain her strength. 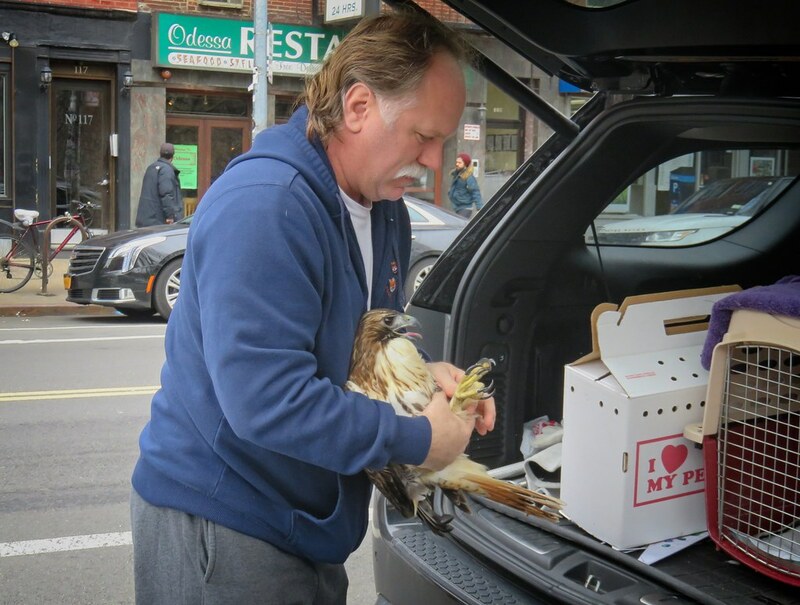 After a final check-up, Dora was reintroduced to her home territory. 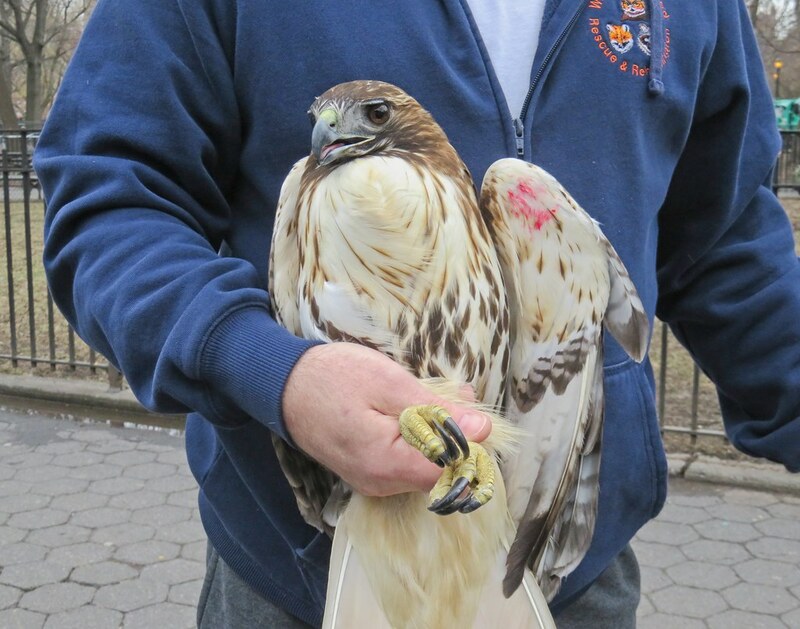 The red mark on her wing is not blood, but just a visual marker that will wear away with time. 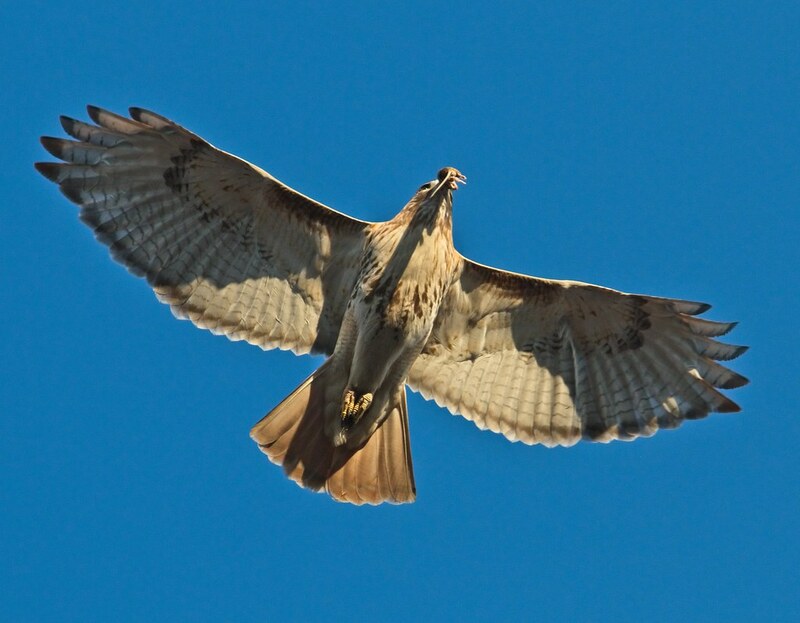 She will, however, have a permanent droop to her left wing. This is likely the only time I will ever be this close to her! After flying up into a tree, Dora rested a while. Christo came near right away and cried out. They seemed to instantly recognize each other and Dora appeared very relaxed. Christo eventually flew off for a while, and I will post more about his (and Nora's reaction) later. 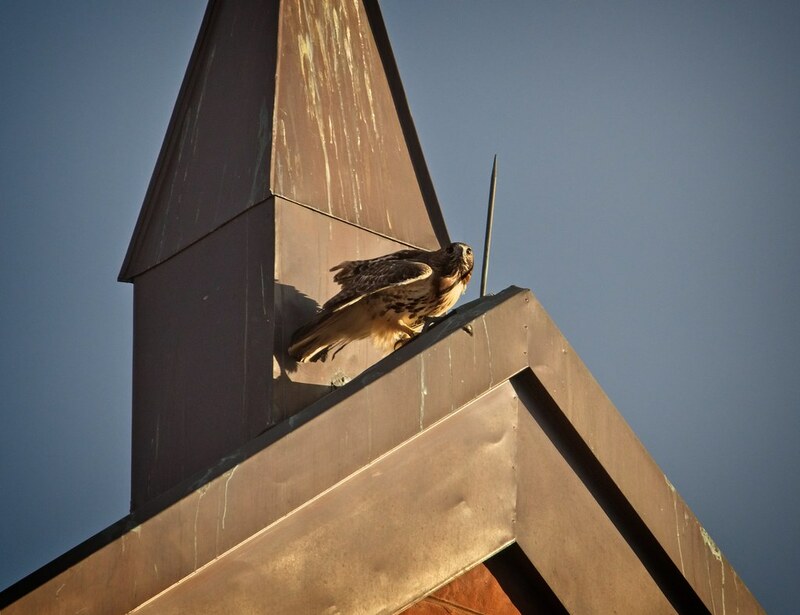 Late in the day, Dora visited some of her regular perches like the tall sycamore on Avenue A & St Mark's Place, last year's nest by the Temperance fountain, and the top of St Brigid's church. 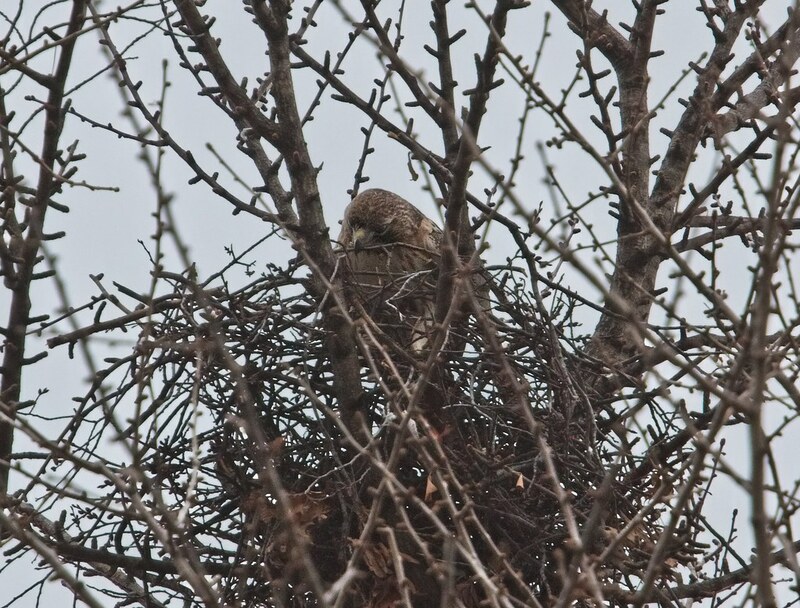 She also spent about 45 minutes sitting in the ginkgo tree nest. More on that later as well. 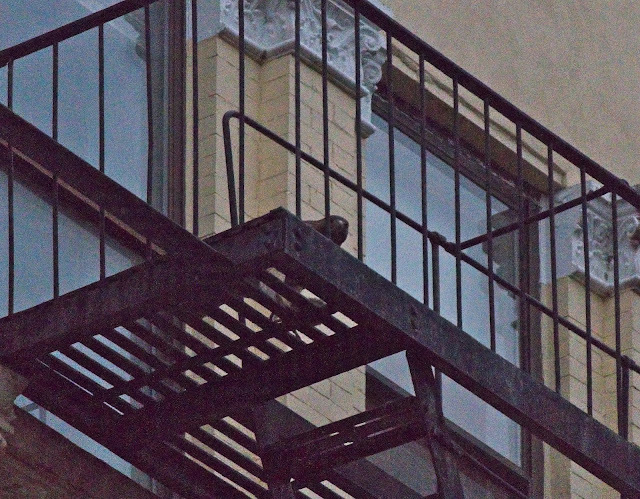 As the sun set, Dora flew up to one of her old roosting places, a fire escape at 7th Street and Avenue B. 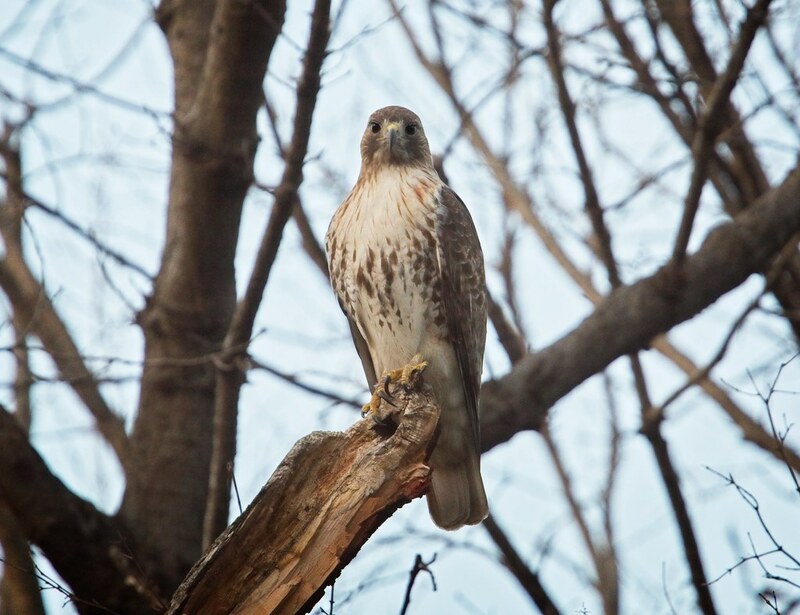 By this time, she'd attracted a large crowd of admirers who were delighted to see her back in the neighborhood. Even a sanitation truck stopped so the crew could take a look. The question now is, what happens next? Some may argue that Dora should not have been returned to the park because Nora is settling in, but it was explained to me that this is really the best place for her. Dora is not a candidate for captivity - she is way too wild and needs to be free. 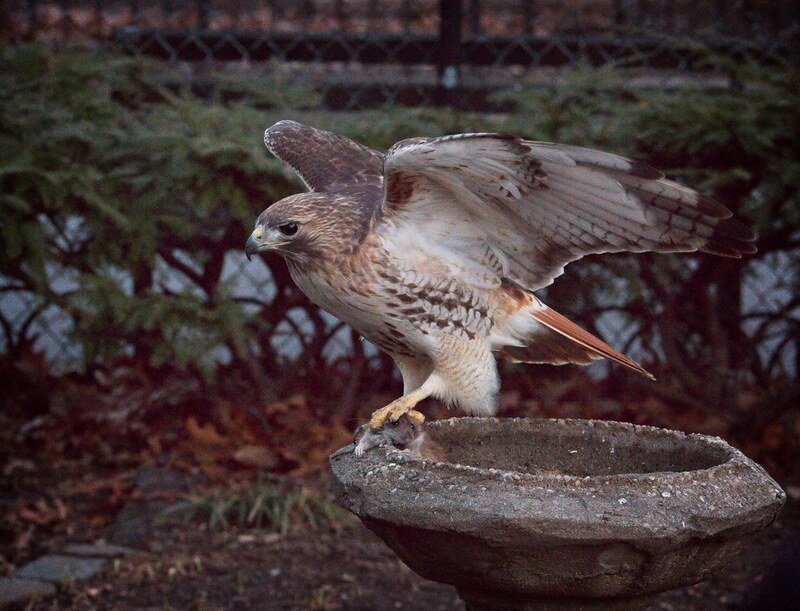 Releasing her in Tompkins means she is in her familiar territory and it is the easiest place for her to find food. Ideally, Christo will bring her food, but if he doesn't, she shouldn't have too much trouble obtaining it herself. The way I see it, Dora would not be alive if she was not picked up and taken to rehab, and this is her second chance. Things might not turn out the way we want them to and there is a chance Christo and Dora will not be a mated pair, but they have to work that out themselves. We can only watch and learn. WINORR is a non-profit that receives no funding. 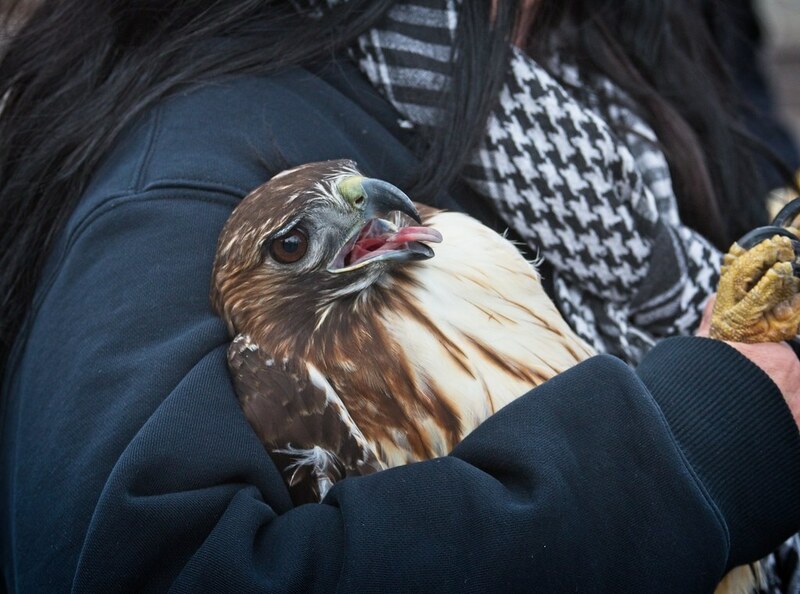 The Horvaths take care of our urban wildlife out of the kindness of their hearts. Please consider donating to their cause. 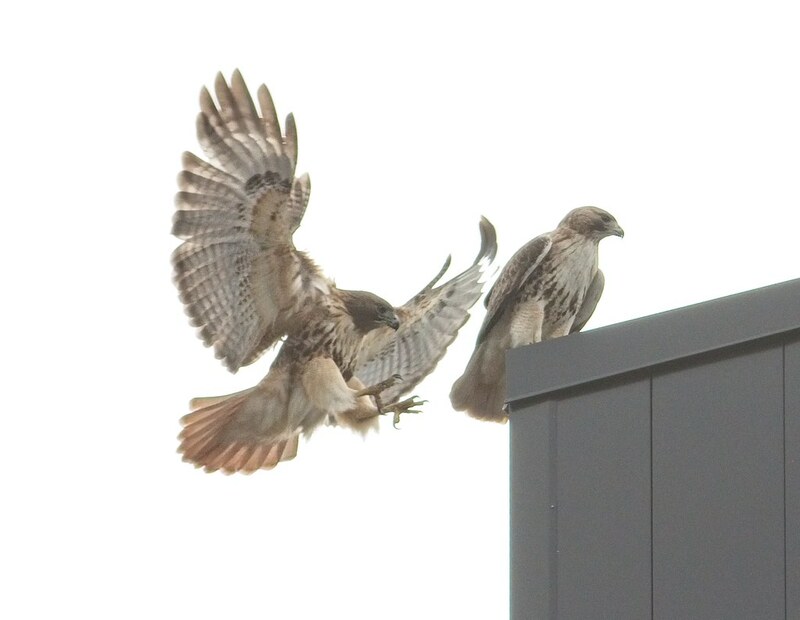 I don't have much of an update this week on red-tails, Christo and Nora. Christo is still working on the nest in the Ginkgo in Tompkins Square. 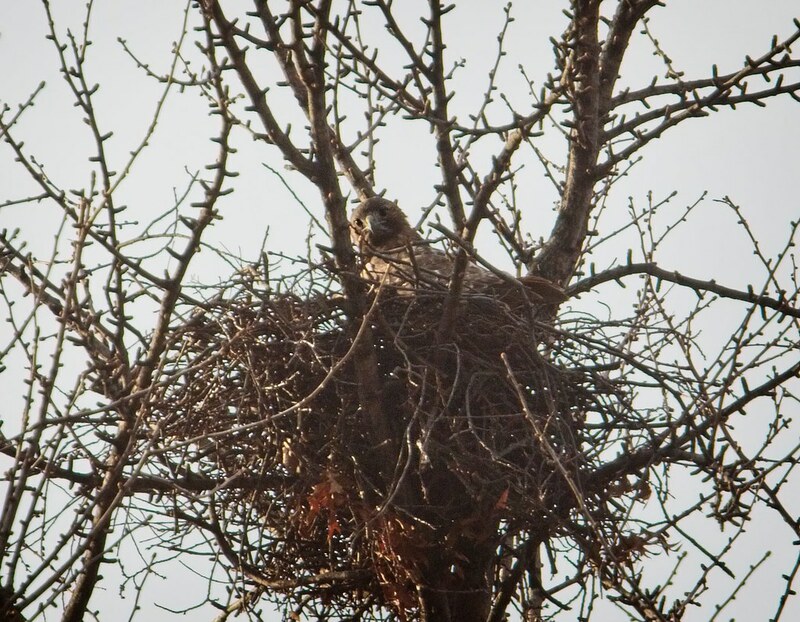 Nora has been seen in the nest, but I don't know if she's actually pitched in and helped build it. 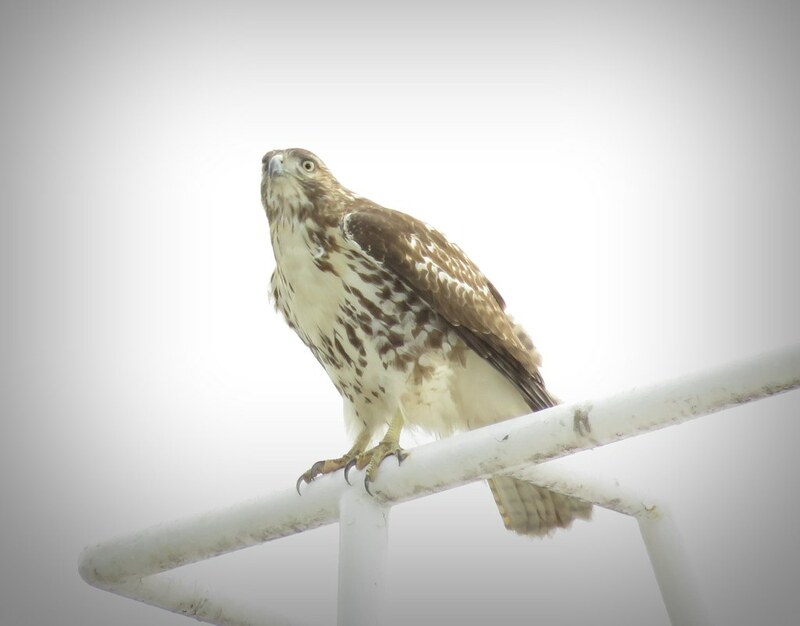 Both hawks have been difficult to track this last week because of the dark and rainy weather, but also because they spend the majority of their time outside the park where I can't find them. Last Thursday, Christo graced us with his presence just after sunset. 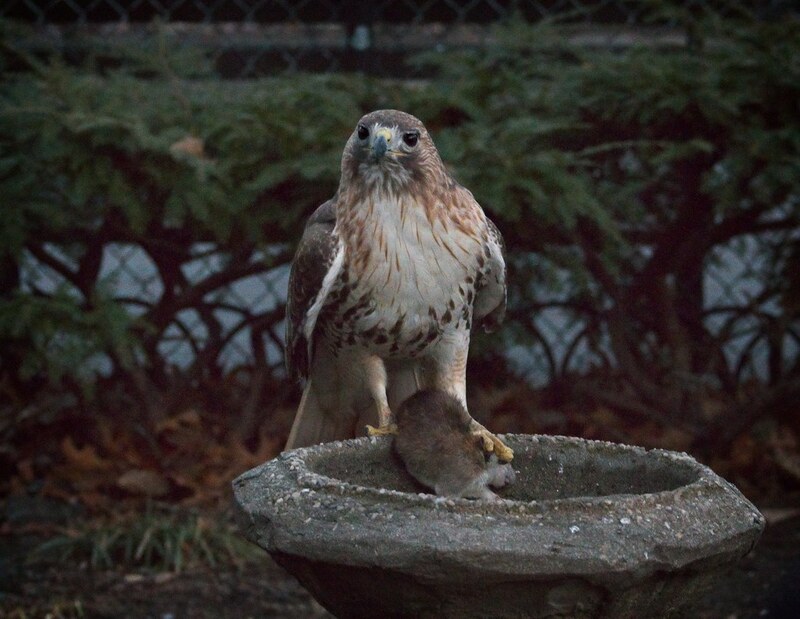 He caught a rat behind the park offices, then perched on the birdbath with it. He seemed to dunk the rat in the water. I'd like to think Christo was choosing to wash off his food before eating it, but the action was likely not deliberate. It was a particularly big rat, and it's more likely Christo was resting before carting the heavy catch up to a higher perch. 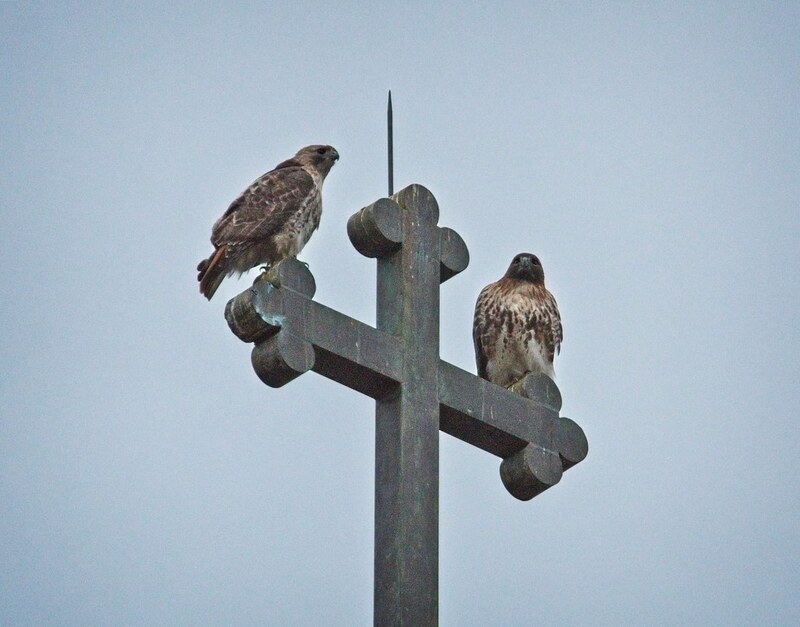 On Sunday, both hawks made an appearance during a brief break of sunshine. 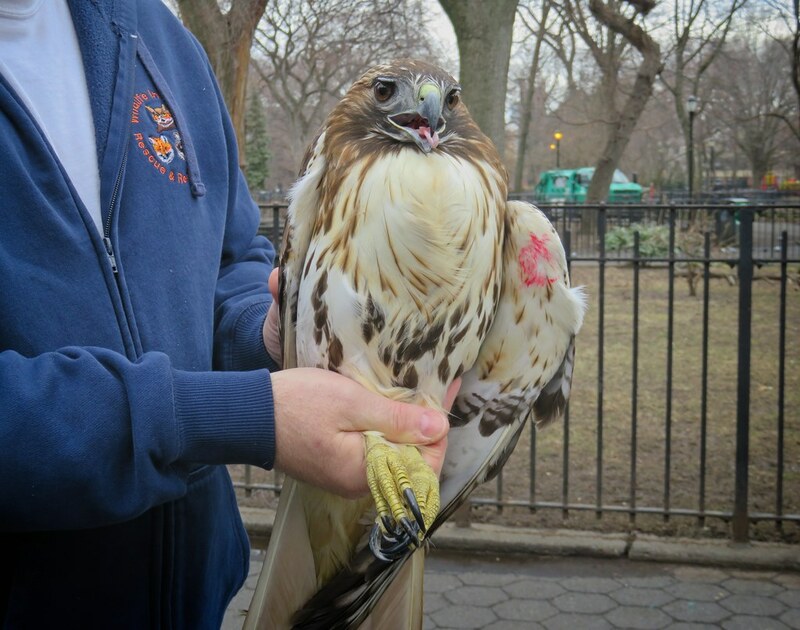 Christo flew into the park from 7th Street at Avenue B with a mouse in his beak. 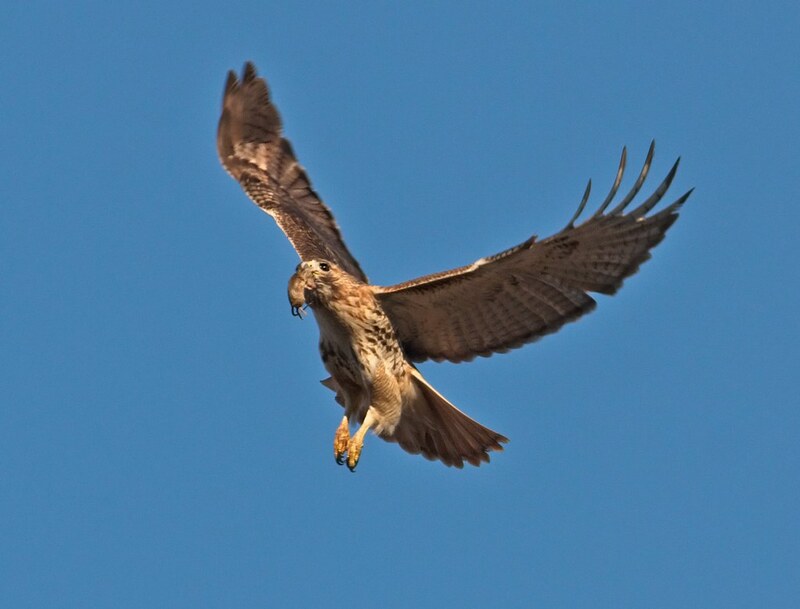 He circled the SE corner of the park, carrying the mouse and calling for Nora at the same time. 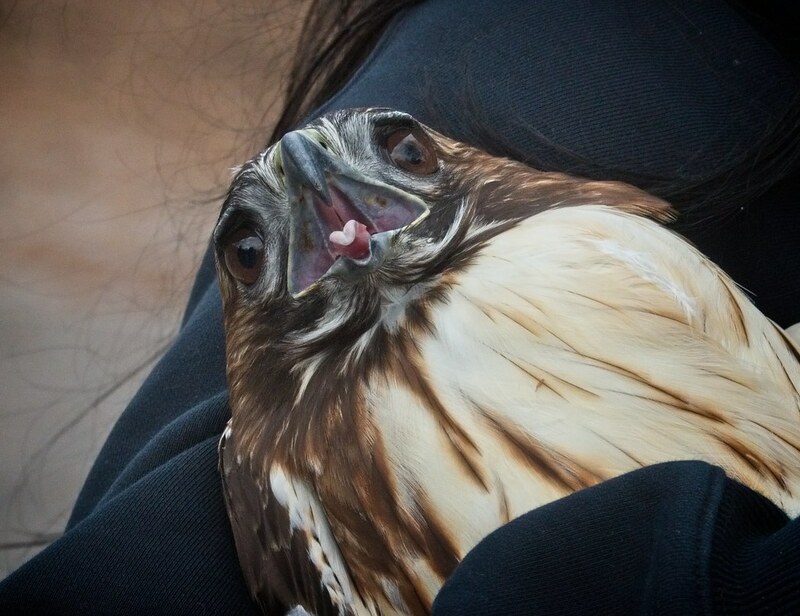 I must have missed the moment when he transferred the mouse from his beak to his talon in mid-air. 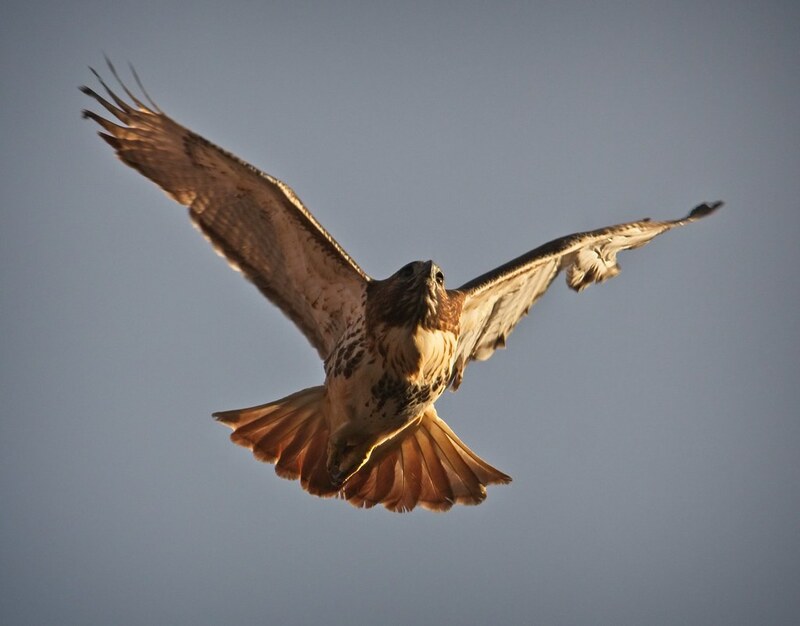 Getting no answer from Nora, Christo flew south over the buildings where I lost sight of him. 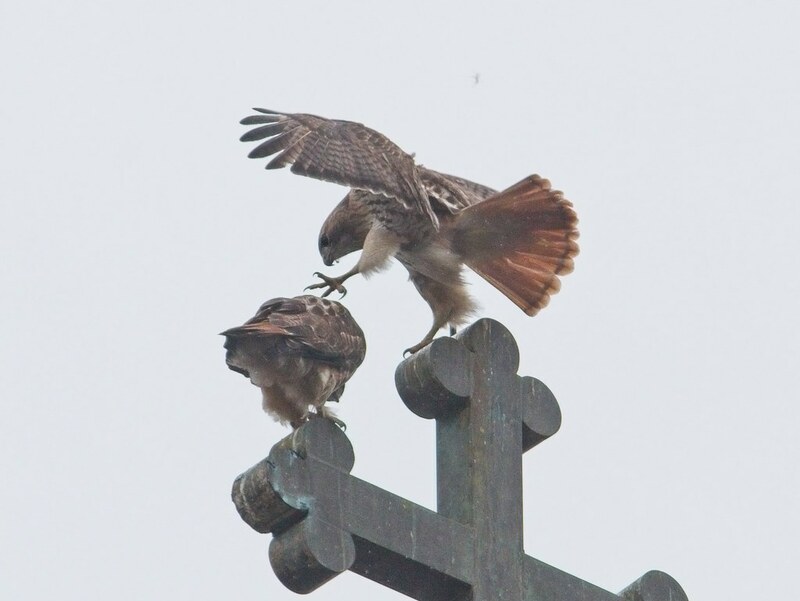 A few minutes later, Nora appeared on the east side of the park and circled over the nest before disappearing over St Brigid's church. 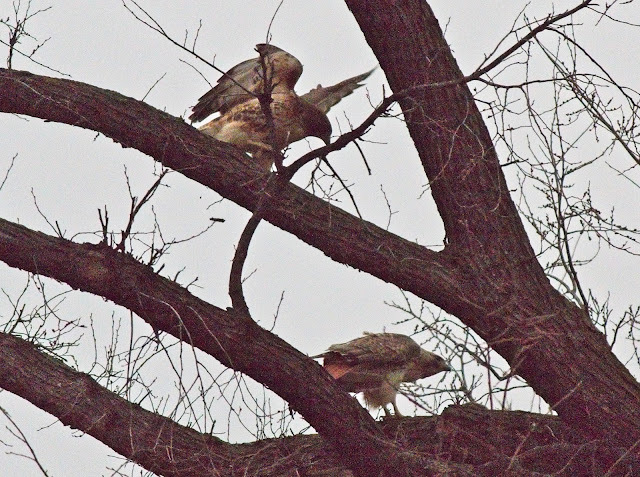 On Monday, both hawks showed up around 5pm when it was dark and rainy. The photos below are the best I could do in bad conditions. Christo showed up first, and went hunting for dinner behind the park offices. 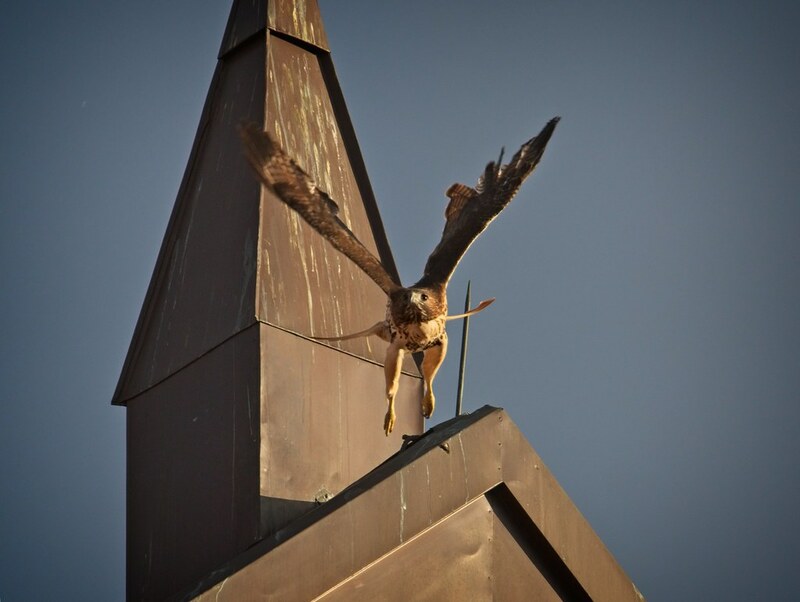 Nora appeared atop the Christodora, at which time Christo made a beeline for the nest. 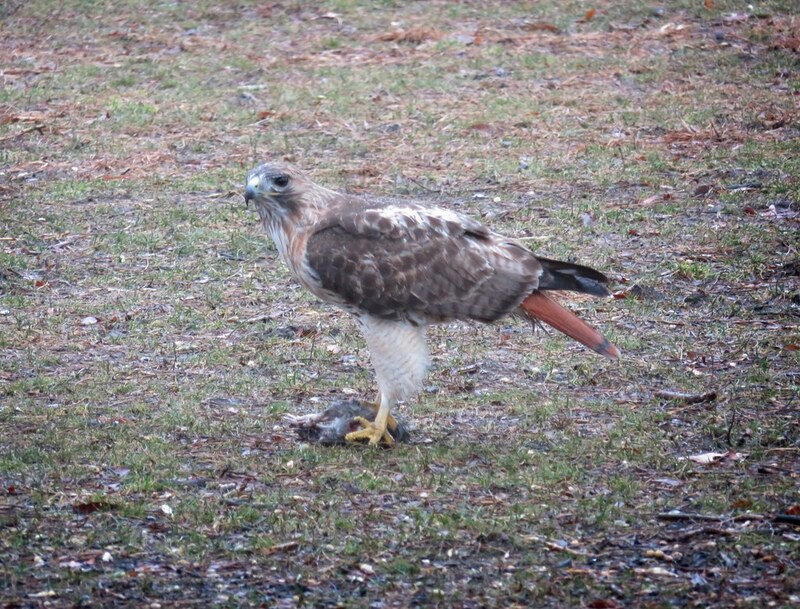 After a few minutes, he caught a rat in the SE corner of the park and took it back to the nest. 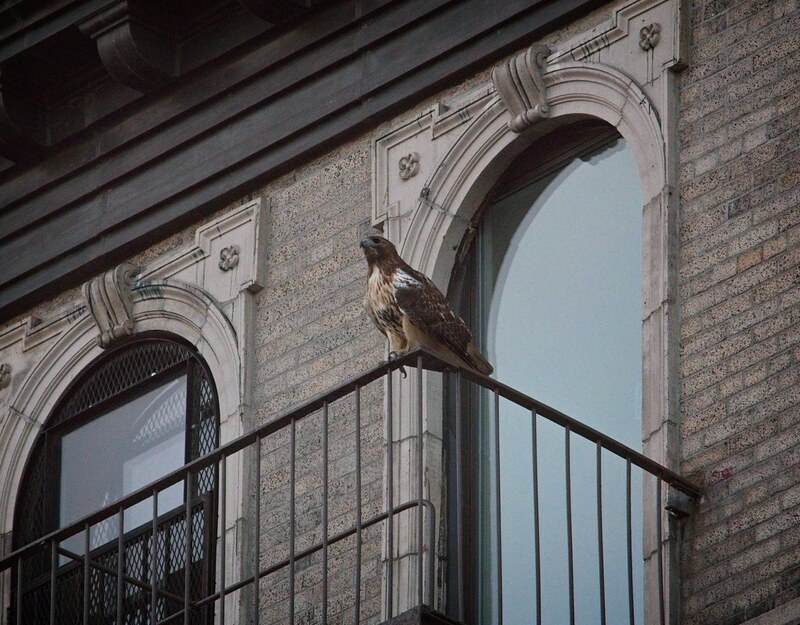 Nora then dove down from the Christodora and perched on the Newsboy building across Avenue B from the nest. 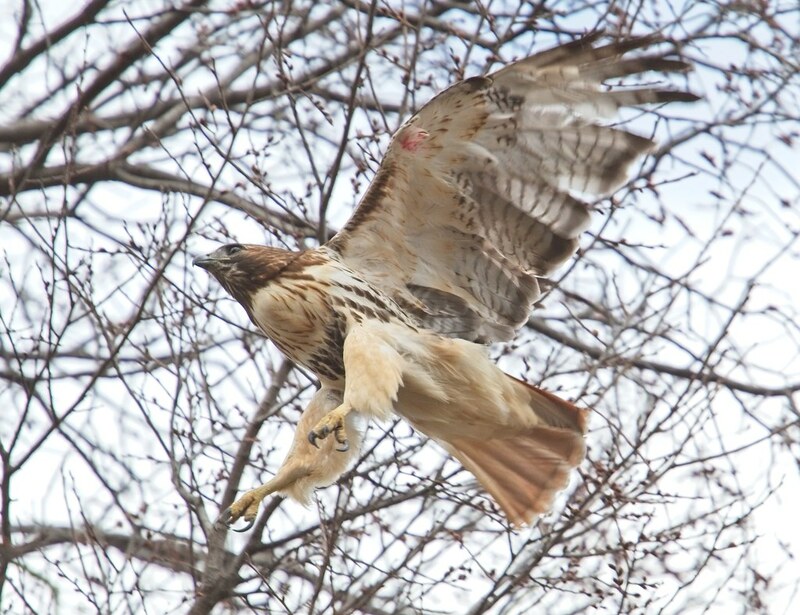 Christo flew the rat to the big tree on the central lawn and called for Nora to come get it. 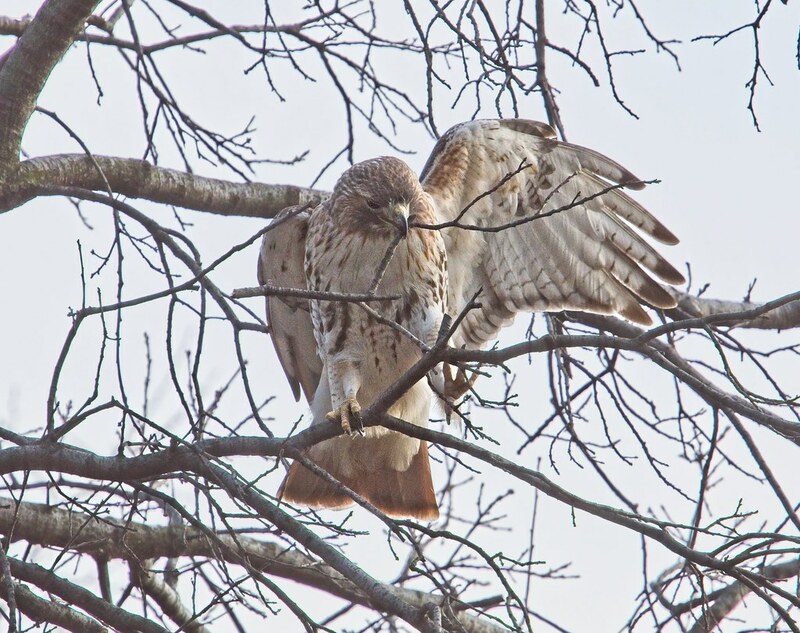 She flew to a neighboring tree, about thirty feet away. Christo kept trying to convince her to come get the rat, but she didn't seem all that interested. After a few minutes, he began eating it himself. 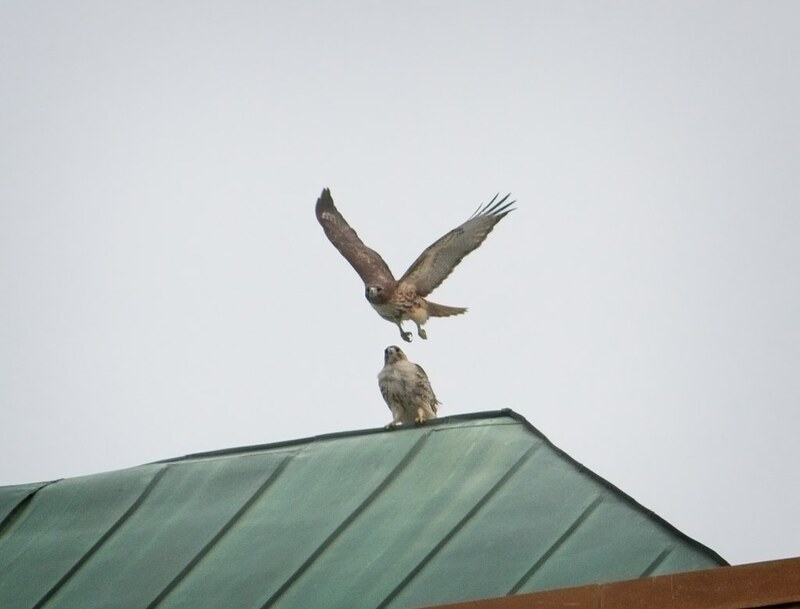 Finally, after a lot of coaxing, Nora flew over to Christo and stood on top of the rat. Christo flew off. 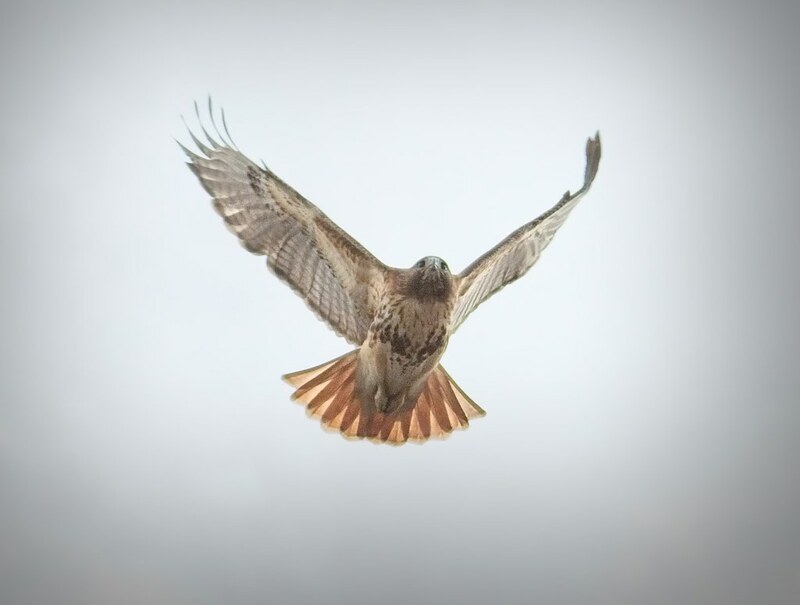 Nora then flew east with the rat in tow. Side note: Blue jays have been hiding in the Holiday Tree in the park and I was wondering if they could be roosting in there at night. 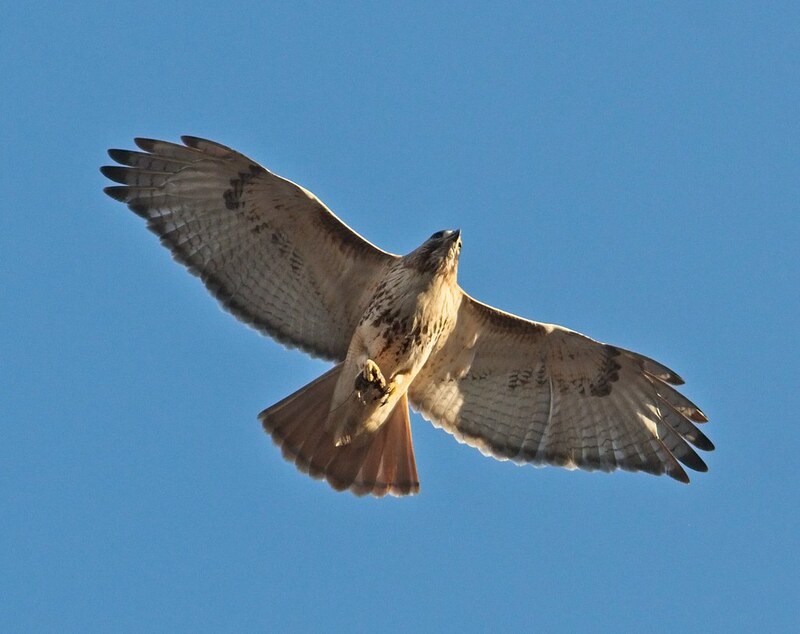 When Nora flew past the tree, three blue jays shot out of the tree, answering my question. Nora carried the rat to a fire escape on 8th Street, east of Avenue B. She ate for about ten minutes, but decided to abandon the rat and flew down the street towards Avenue C. By that time, it was really dark and raining and I wasn't up to finding out where she went. If you look out your window and see a mangled rat on the fire escape, this is probably how it got there. 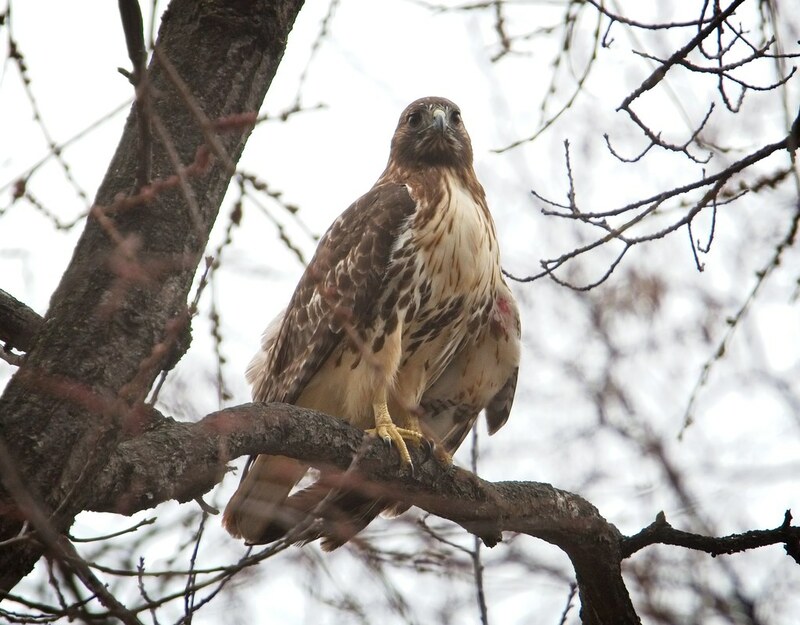 Red-tail Christo is still working tirelessly on his nest in the ginkgo tree on the east side of Tompkins Square. 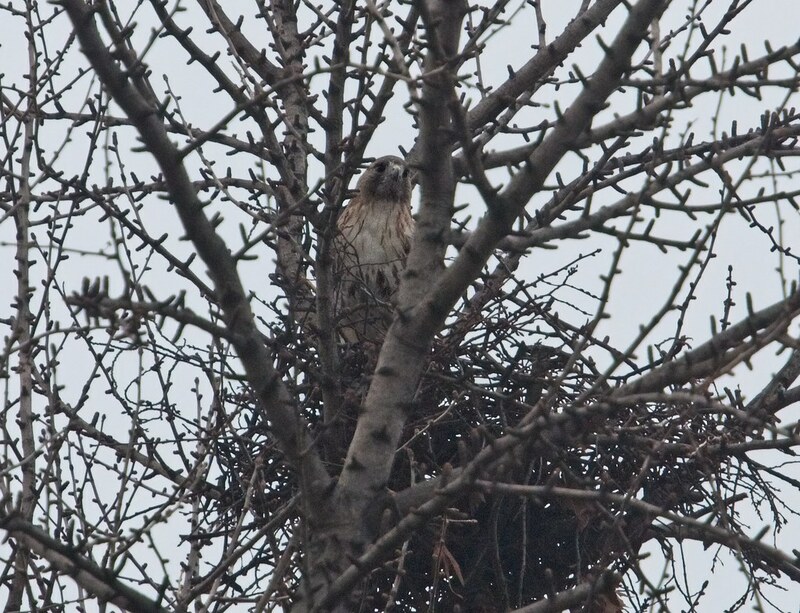 Nora has been spotted in the nest as well, but I have yet to see her gather sticks or engage in any other activity. During a brief moment of sunshine over the dreary weekend, I caught up with Christo as he broke sticks from trees on the east side of the park. Nest-building is hard work. Fact! On Sunday, I found both Christo and Nora atop the cross of St Nicholas of Myra on Avenue A and 10th Street during a deluge. It's hard to see the rain in this photo, but it was pouring. 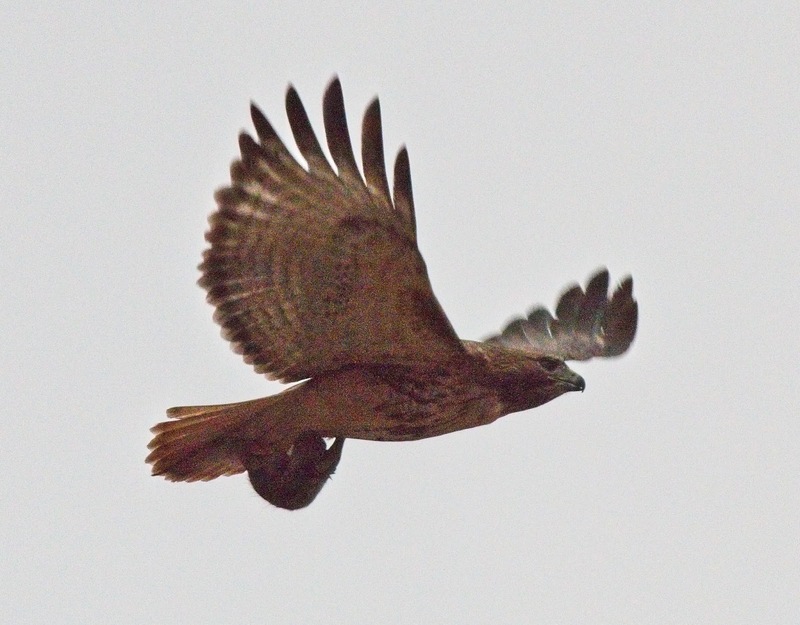 People sometimes ask me where the hawks go when it rains and my answer is they go nowhere. 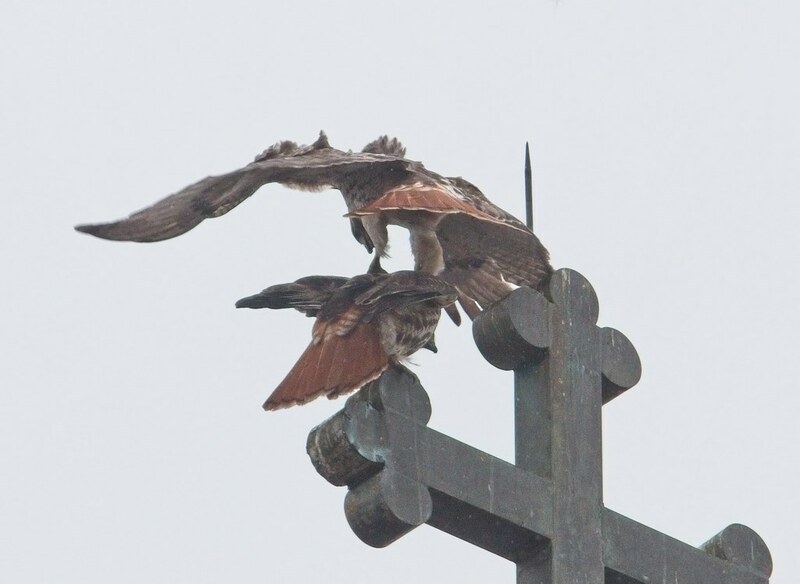 From what I've seen over the years, the hawks take advantage of the rain and enjoy power-washing their feathers. 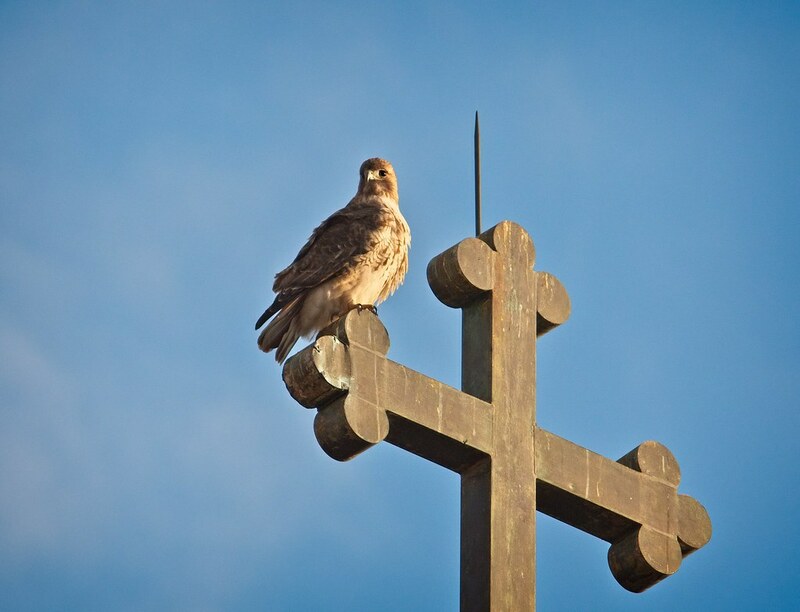 Afterwards, they often perch in a high place and let the wind dry them off. Below are some short videos of Christo (on top) and Nora (on the right) enjoyng Nature's spa treatment. This video was taken at a slightly different angle. 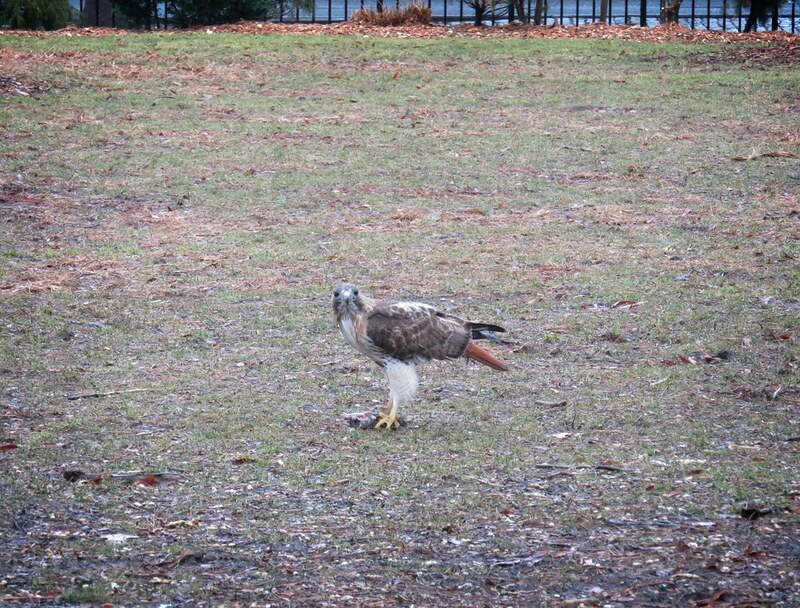 Eventually, Nora flew off and Christo came down into the park where he landed on the central lawn and inspected an old wet dead rat. Christo took a few bites of the rat before a dog got too close and spooked him. I'm hoping for better weather and more nesting activity in the next couple of weeks. 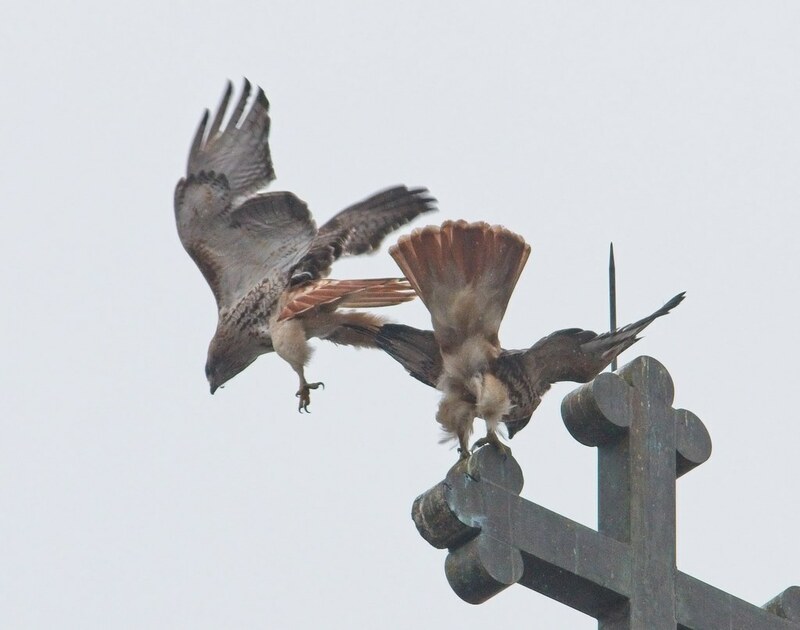 Christo seems to be taking the lead showing Nora how things are done during hawk mating season. 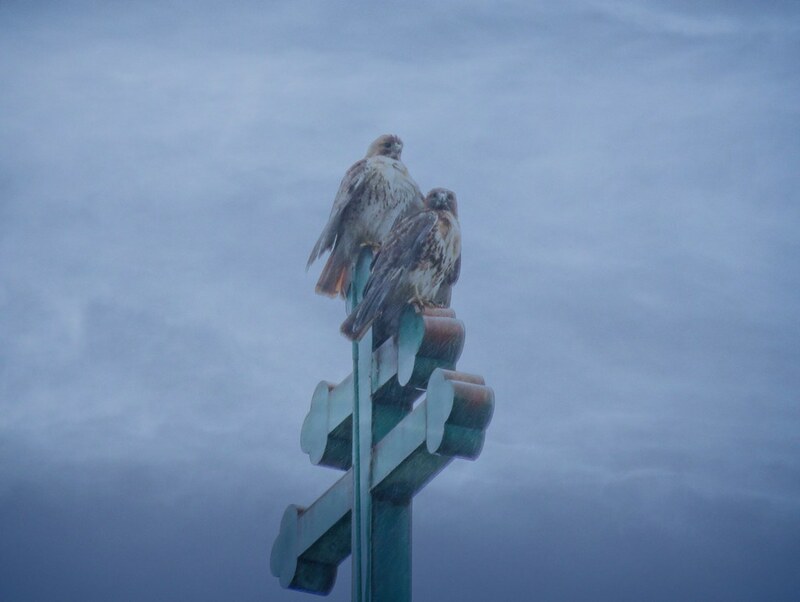 Over the weekend, I caught up with the pair as they hung out on the cross at St Brigid's on Avenue B and 8th Street (Christo is on the left, Nora is on the right). 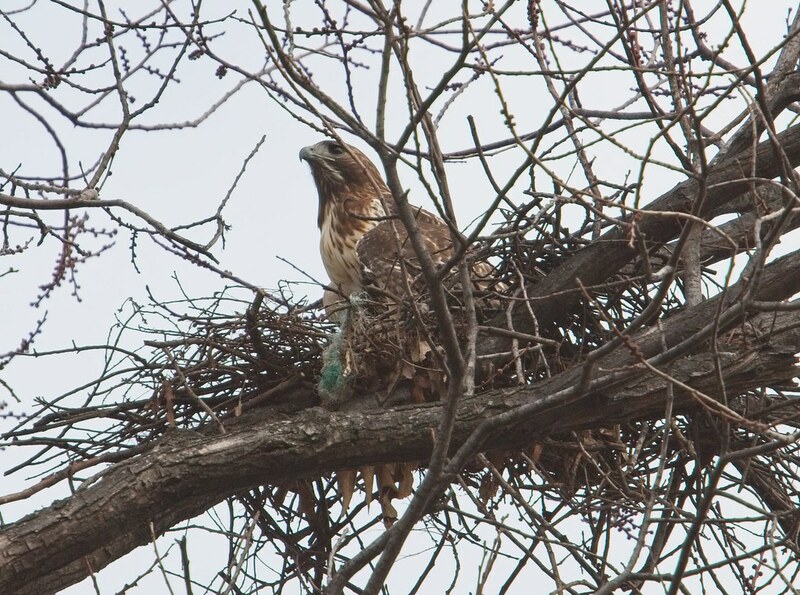 After a short meeting, Christo flew across the street to Tompkins Square Park to work on the nest in the ginkgo tree. Nora stayed behind and watched. Christo seems to be showing Nora what to do. I'm wondering if she's young and maybe has never built a nest before. Or, maybe she was raised in a non-tree environment and needs to learn. 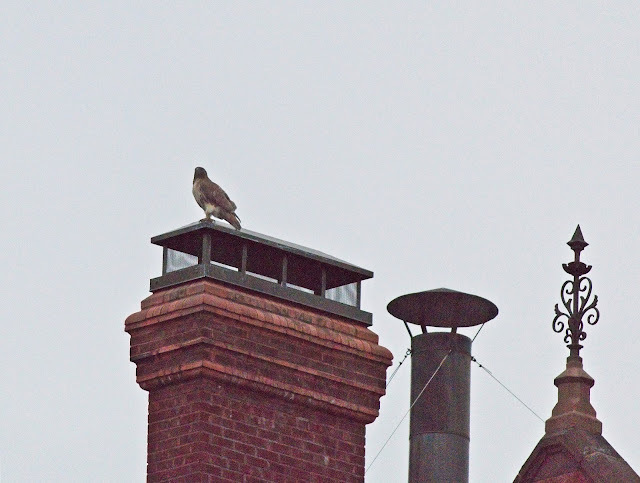 She appears to be comfortable on buildings, so perhaps she was born in an urban area. Unfortunately, her background is a mystery. 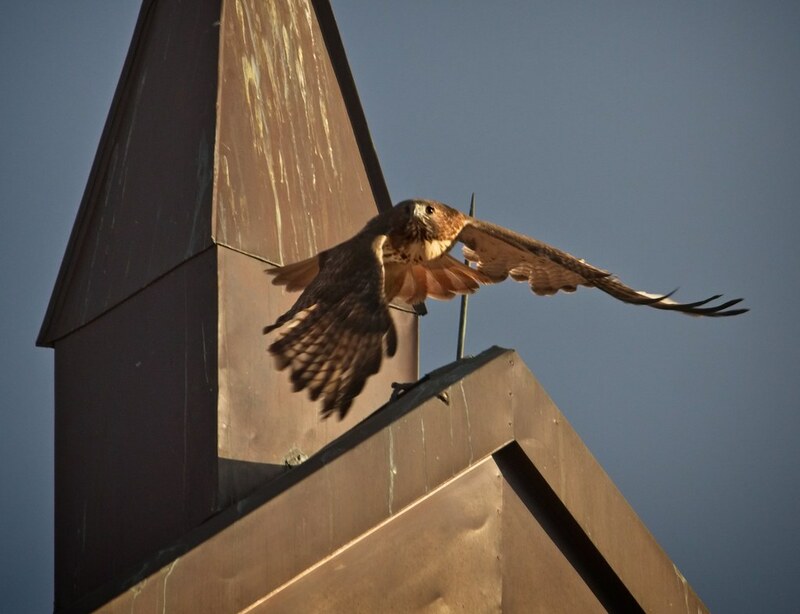 While working on the nest, Christo would look back at the church where Nora perched. Do you see what I'm doing? Wanna join me? ...and hopped on Nora's back! Nora seemed to be more confused than anything else. Hmm, they didn't quite mate, but came close. After the three-second balancing act, Christo took off and returned to stick-gathering. 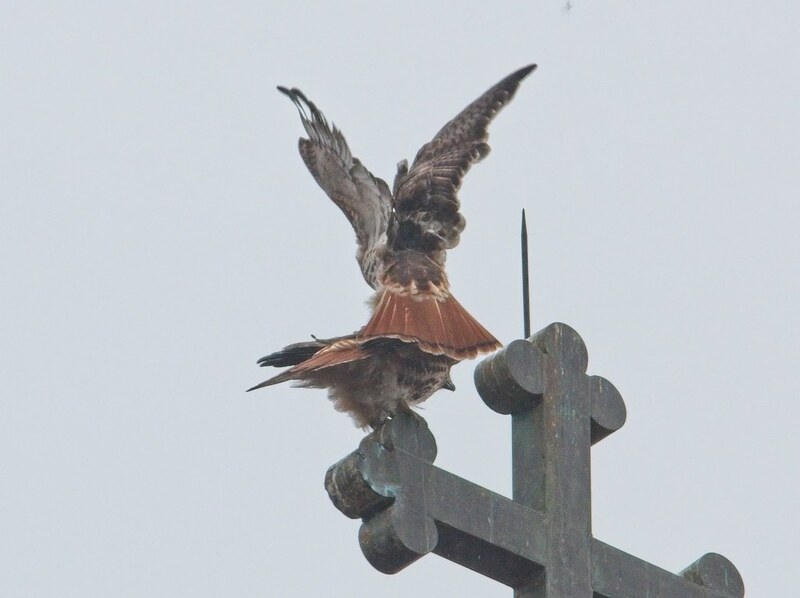 Nora stayed on the cross for a while, then eventually flew off to roost. Christo is moving ahead with what he's supposed to be doing for mating season. Maybe Nora will become more enthusiastic after hormones kick in during the next few weeks. Who could possibly resist this awesome guy?? ?